So, Summer Kid’s Clothes Week has come and gone… I didn’t get as much done as I wanted, as I was knee-deep in the Sea Breeze Mini QAL. But I did find time to make a few things that I’m happy with. 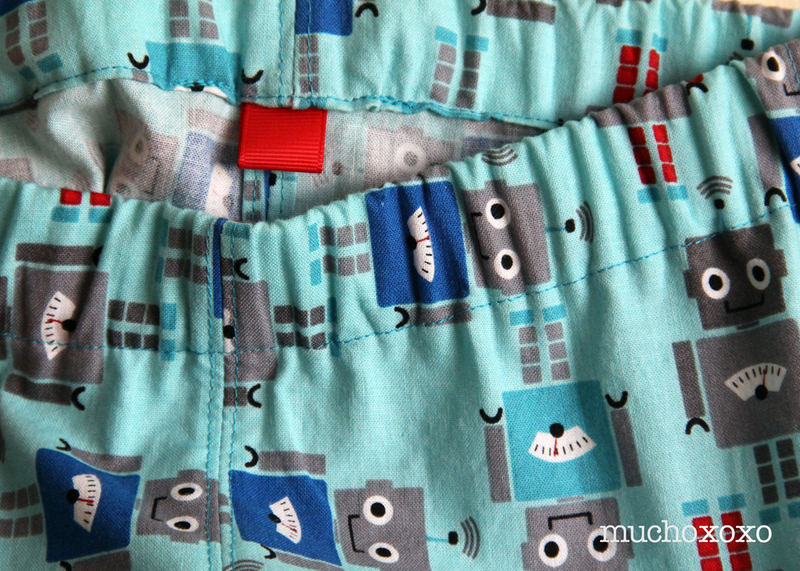 First up, this fun pair of robot summer shorts! I used the free Summer Shorts pattern from Caila Made, found here. 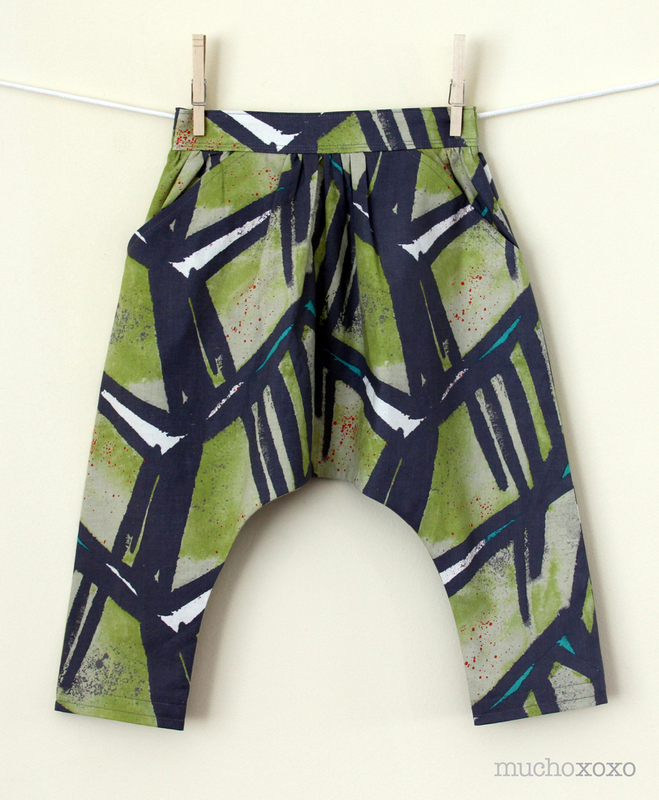 This is a great unisex shorts pattern, and a quick and easy project. And I’m loving this playful FunBots print from Ann Kelle. The only thing I did differently from the directions was to reinforce the seams for added durability. 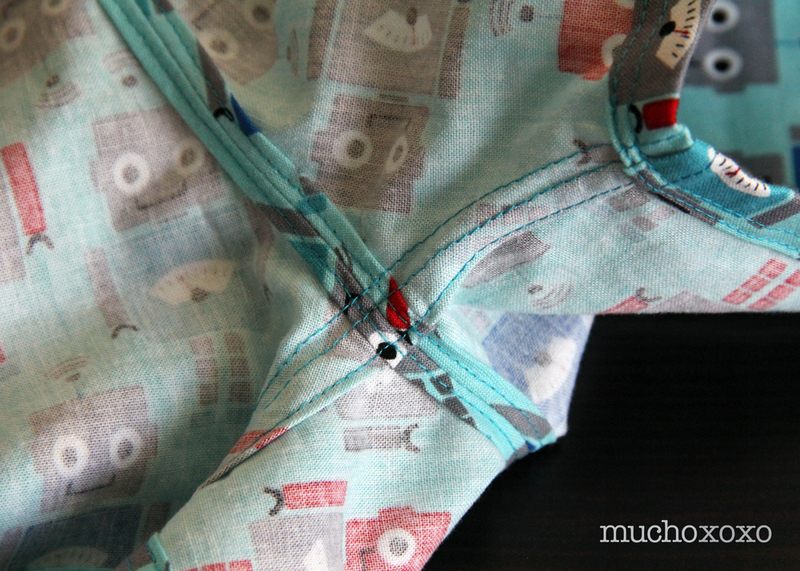 Made By Rae has some fantastic tips on sewing seams that are built to last. Seeing as these are for my very active 2-year-old nephew, reinforced seams seemed like a good idea. Not to mention, no raw edges to fray with repeated washings. Definitely worth the extra effort. Can’t wait to show you what else I made, just have to wait for it to get to the recipient so I don’t spoil the surprise! 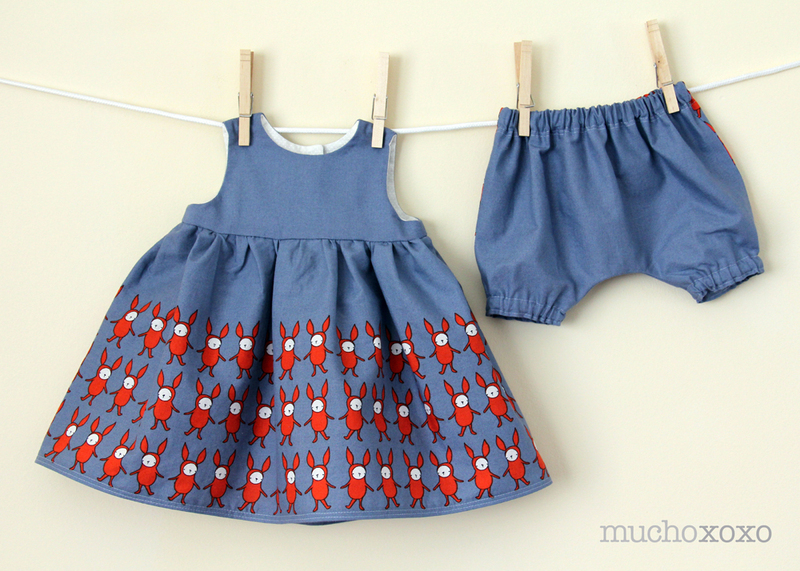 summer kid’s clothes week, eek! Summer Kid’s Clothes Week starts tomorrow, and I am completely unprepared! I’ve been so preoccupied with the Sea Breeze Mini Quilt-A-Long (which also starts tomorrow) that I haven’t really planned anything! This time around, the inspiration is “kid art.” I predict we’re going to see lots of fun prints and playful designs. I have a few prints in my stash that might have to come out and play for this. I’ll be sharing snippets and peeks along the way on Instagram and all of my finished projects right here. So, who’s in? What do you have planned for KCW? Seeing as Summer Kid’s Clothes Week is next week (eek! ), I figured it was time to share my last project from Spring KCW! 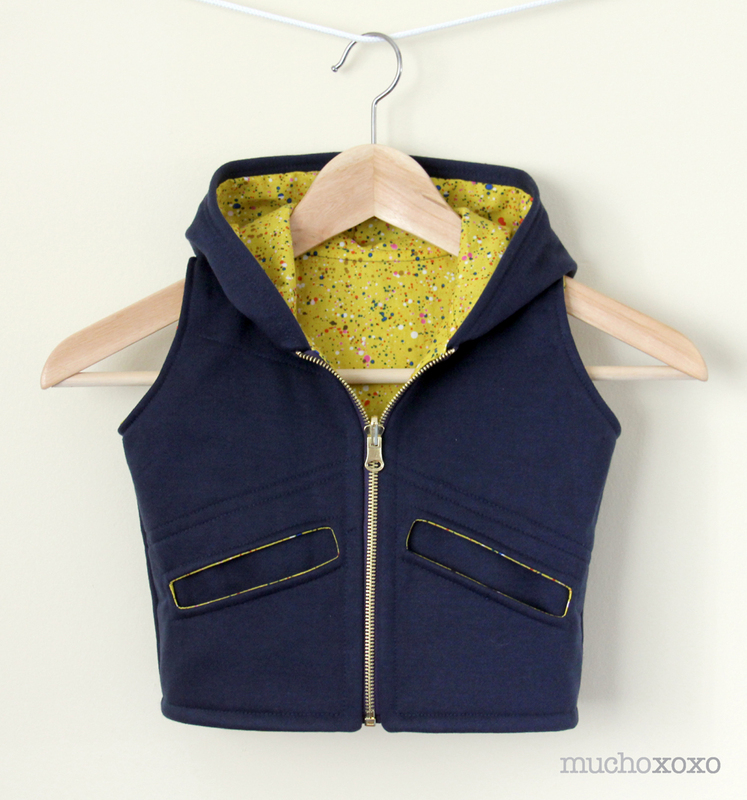 Here’s my take on the fantastic Aztec Hooded Vest from See Kate Sew. I held off on sharing during the actual week because I wanted to keep at least one thing I made a surprise for the recipient (well, his mom). And then, of course, I completely forgot about it! So I’m sharing it with you now… Better late than never, right? The pattern is available from See Kate Sew here. The instructions were clear and easy to follow and it came together fairly quickly. 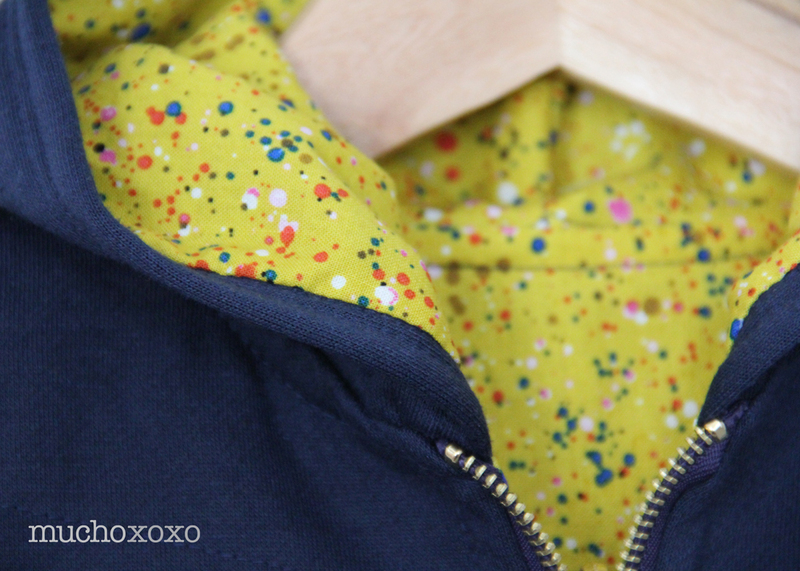 I used a super soft navy sweatshirt fleece for the outside, and the inside is another favorite print from Jay McCarroll. I’m loving the combination of navy and mustard. Pretty fun, isn’t it? 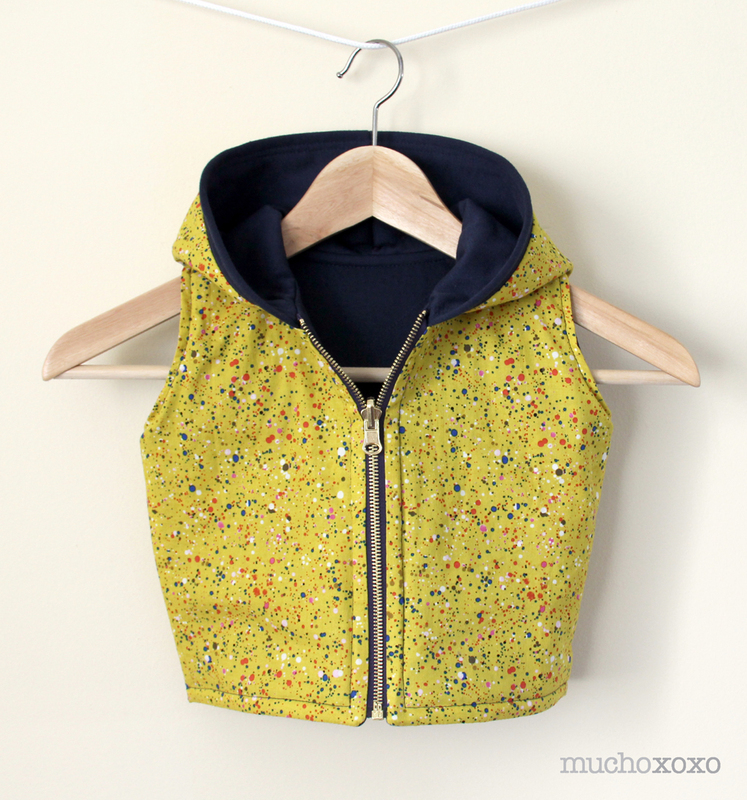 And yes, it’s completely reversible! As suggested, I added some topstitching to the outside to give it a bit of a quilted look. It’s subtle, but a very nice detail. And the open welt pockets are a fun addition. I love that the lining fabric just barely peeks out. And what about that oversized hood? Too cute! 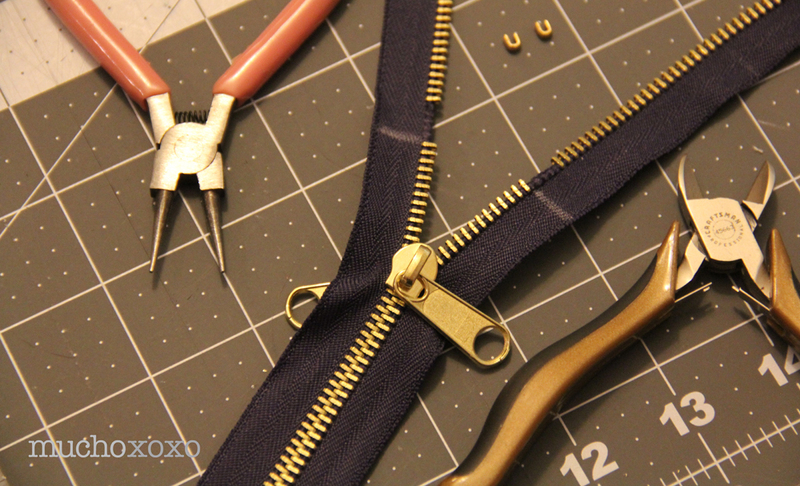 I think my biggest struggle was finding the right reversible zipper… Until I realized how easy it was to make my own! This was a bit of a “duh” moment for me. I’ve altered plenty of plastic zippers, but the thought of doing this to a metal zipper never crossed my mind. It’s totally doable, and really not that hard! Here’s a great tutorial if you want to give it a try. I bought a metal reversible separating zipper from Jo-Ann Fabric to start with. 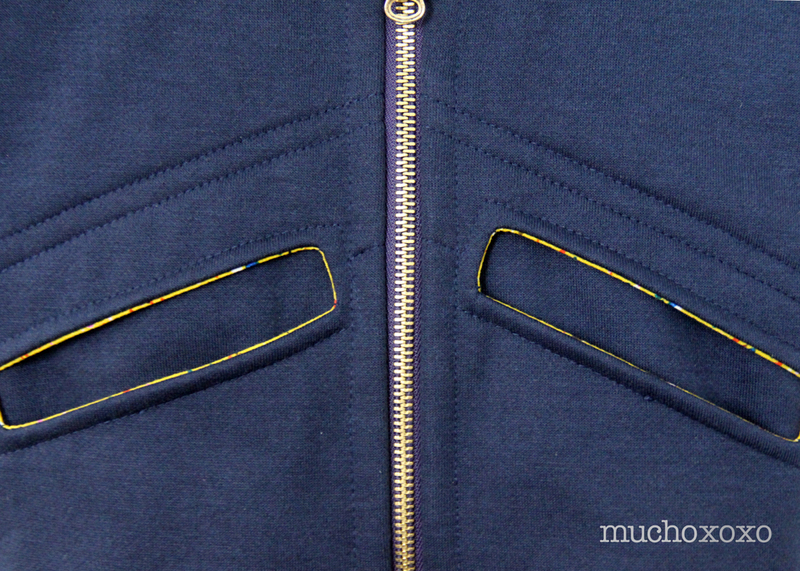 This one has a double-tab zipper pull (above left), which means that each side has its own pull. I wasn’t crazy about how it looked so I ordered a replacement pull like this (above right). I also picked up a few extra top stops (those things that keep your zipper from coming off the ends). These are good to have if you’re planning on shortening zippers. You can sometimes reuse the originals but they’re nice to have just in case one breaks. And keep in mind, if you’re ordering replacement pieces, make sure you order the correct size! Over all, I’m very happy with how this turned out. I’ve already got a few more planned in my head… And is it weird that I want one in my size too? These itty bitty leggings are just the cutest things, aren’t they? I don’t have a serger, and I’ve never really sewn knits on my standard machine (although you’d never know it by the number of them I have in my stash). I’ve wanted to try, but like so many people, I was a little apprehensive to take the plunge. So when I saw this pattern from Made By Rae, it seemed like a good starting point. Simple pattern, and only a small amount of fabric needed. Besides, how can anything so incredibly cute be intimidating? Right??? 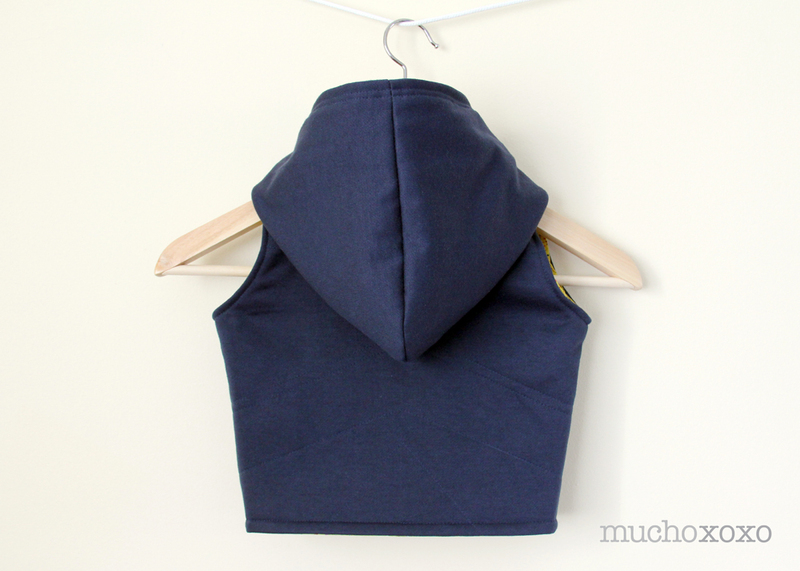 I read quite a few articles and posts with tips and tricks for sewing with knits (here’s a good one if you’re looking for somewhere to start). After all of the reading (and worrying), the biggest lesson I learned is that there’s really no reason to be afraid of knits! It’s that simple. Test your fabrics. Try things. Expect mistakes, and don’t give up! These are so stinkin’ cute, and they come together so very quickly once you get the hang of things. With the number of people I know that are expecting little ones, I can’t wait to make more! 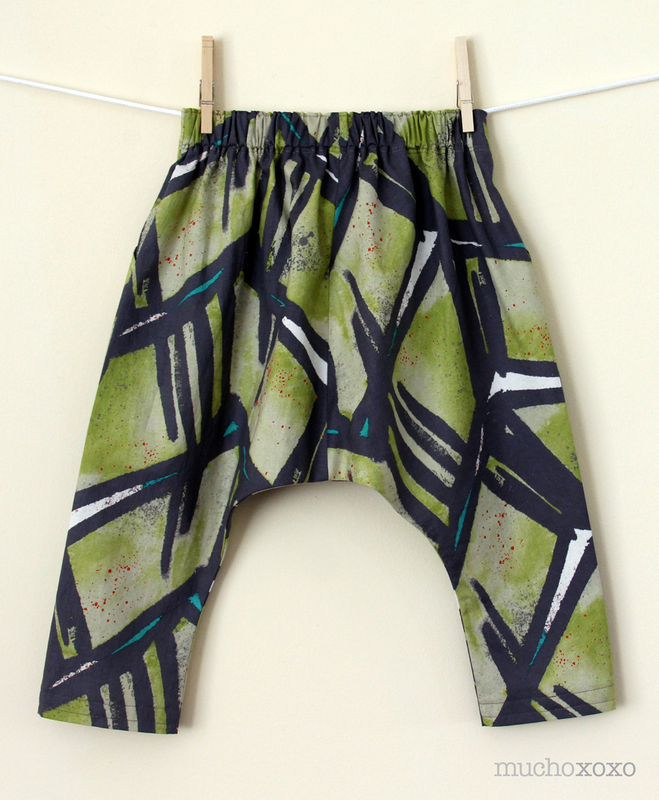 I’m not sure how I feel about harem pants on adults, but they’re pretty cute on the littles. I knew I wanted to make some pants for my nephew and this seemed like a fun option. This pattern is from suburbia soup, and it’s just great! It has a few options to play with, which is always fun. After making the pocket version, I’m thinking I have to do the basic version too! 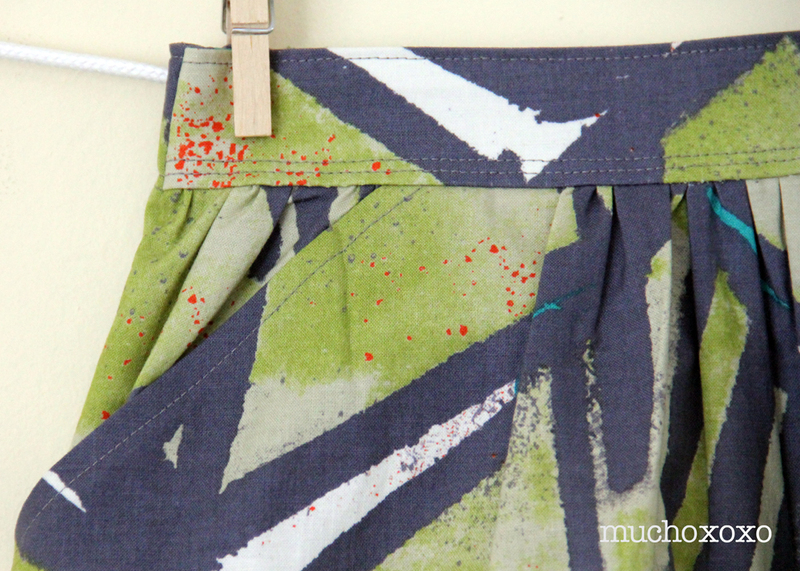 I chose one of my coveted Jay McCarroll fabrics for this because, well, it’s awesome! It has a graffiti-esque quality that I love, but it also feels somehow tribal. Perfect for the little dude man! I was a bit unprepared for how much fabric this pattern takes, and I had to make a slight modification to the back by making it two pieces instead of one (just add the seam allowance to the center cuts). But it’s hardly noticeable with this print, yay! Wow! This week really slipped by, didn’t it? 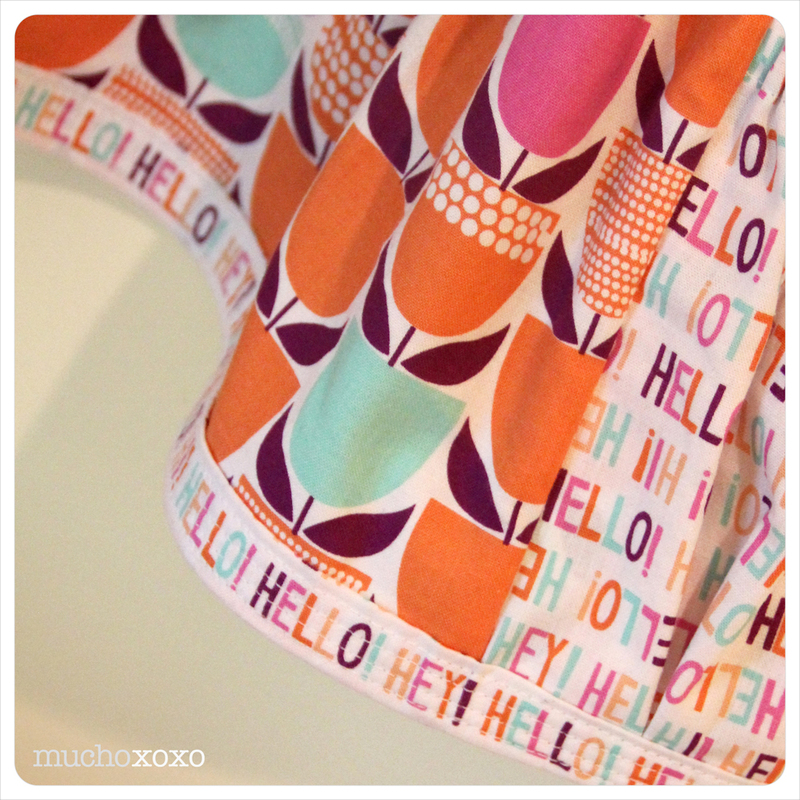 I’ve been having so much fun sewing that I’ve slacked on sharing what I’ve been up to… So here it goes! (I’ll keep it short for now, but I’ll most likely revisit many of these patterns again). 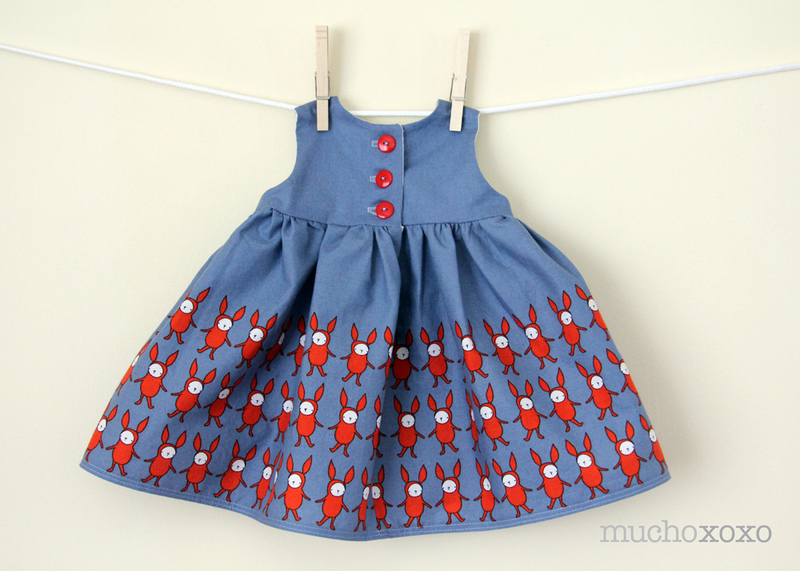 This is the free version of her wildly popular geranium dress pattern. 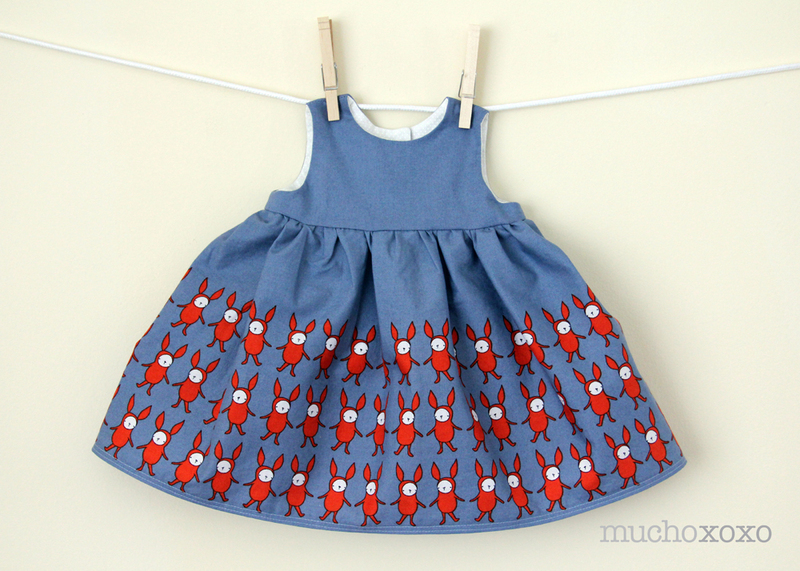 The fabric is Ric Rac Rabbits. I’ve had it in my stash for a while and I just couldn’t resist using it. My gathering skills could definitely use some work, but it’s so cute that I didn’t feel the need to take them out and try again. Oooh! And I finally got the chance to try my buttonhole foot on my sewing machine. And a button sewing foot? I didn’t even know I had that! Am I way too excited about this? Absolutely!!! I decided to add some little bloomers with my leftover fabric. 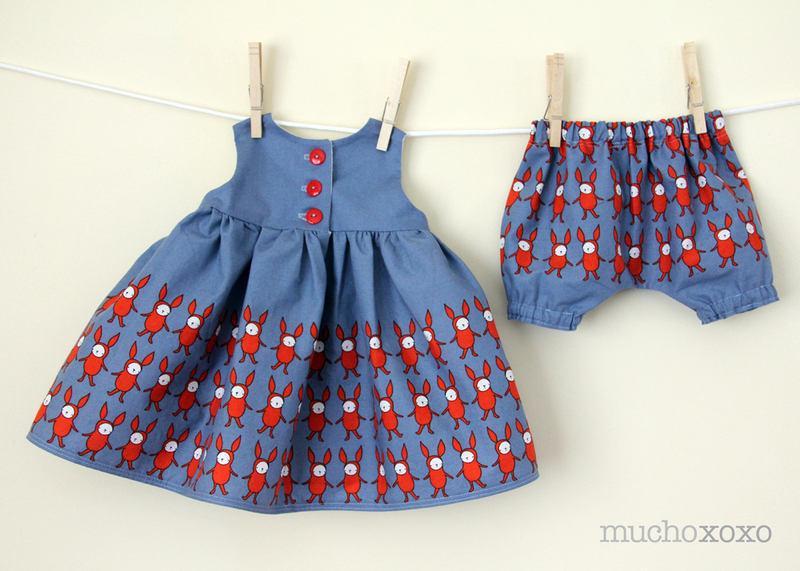 I used the baby bloomers pattern from see kate sew. They were quick and easy. They’re technically reversible (front to back, not inside-out), but I love the idea of the little bunnies on baby’s bum, in place of ruffles. These would also be cute with a simple t-shirt for less dressy occasions. it’s kid’s clothes week! hooray! Spring Kid’s Clothes Week is officially kicking off, and I couldn’t be more excited! For those of you who are familiar with it, I’m sure you know why. For those of you who are new to it, it’s a pretty simple and fun idea– for 1 week, dedicate 1 hour every day to sewing for the kiddos in your life. You can read more about it here. The best part about it is you can do as little or as much as you want, or have time for. And it brings out people of all sewing levels, beginners and rock stars alike. So, just because you’re a newbie doesn’t mean you can’t participate. It’s so fun seeing what everybody does, and I guarantee you’ll walk away with a ton of inspiration! 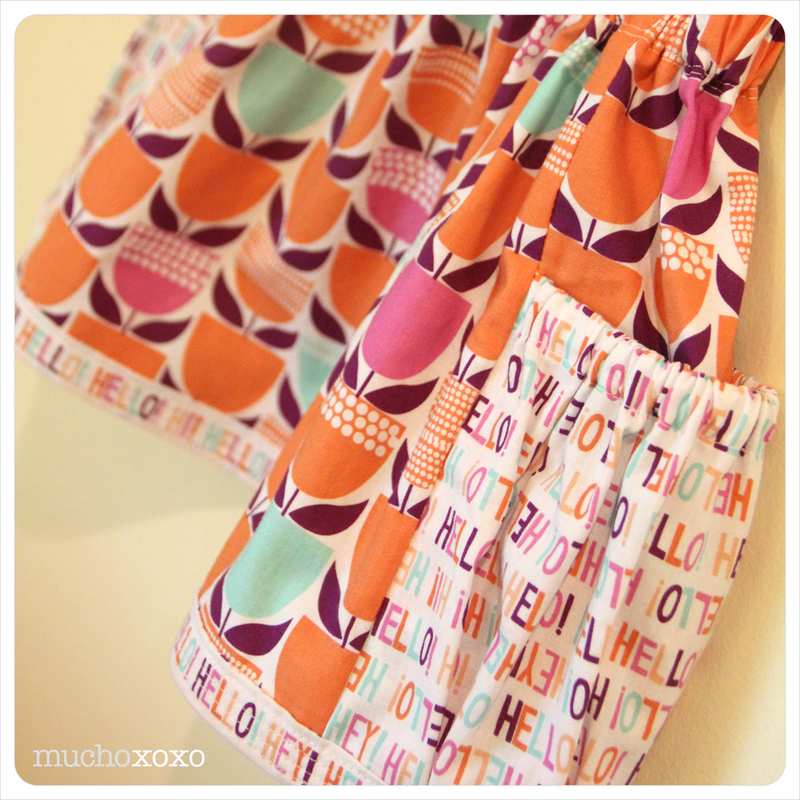 I participated in the Summer 2013 KCW, but only had time to make one thing– a super cute bubble pocket skirt that I absolutely love. This time around, I’m a little more organized. I have a few things planned out. Potential fabric choices have all been pre-washed. Patterns are all ready to go, and so am I! Now the big question… Where do I begin? I predict this week will fly by. I’ll be sharing snippets and peeks along the way on Instagram and all of my finished projects right here. If you’re interested in joining in on the fun, you can register here. I’ve had bubble pockets on the brain lately. So I finally decided to do something about it. And just in time for Kids Clothes Week! I decided to make my own pattern for this, and I definitely tried a few things before I figured out what I was doing. All in all, I think it turned out pretty well. Hopefully the recipient likes it as much as I do! 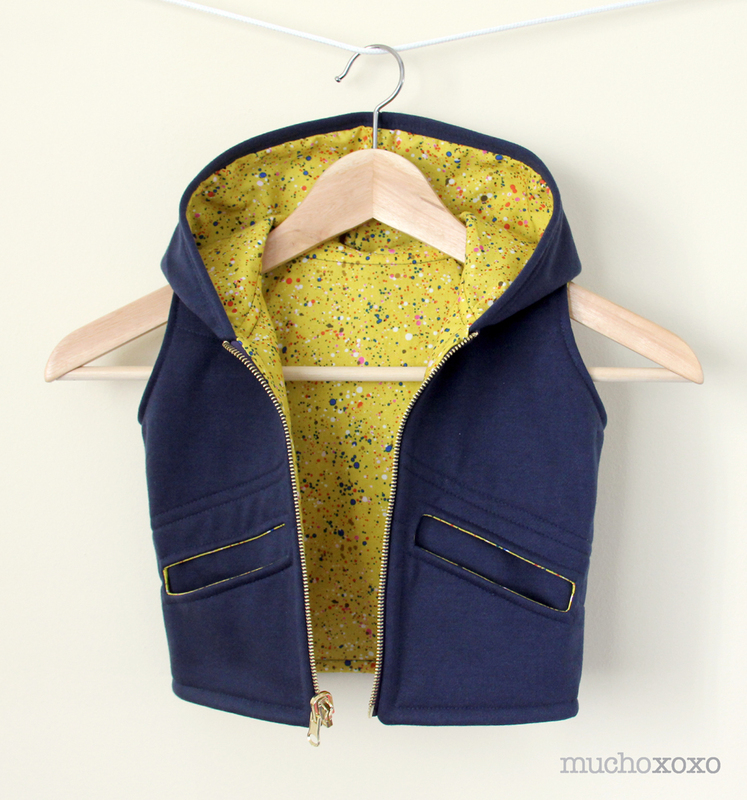 Btw, how cute is this fabric from Erin McMorris? I’m kind of obsessed with it right now. I’m sure it’ll find its way into some other projects. I’m thinking, maybe the lining of an iPad case…? I couldn’t resist making the trim out of the “talk talk” fabric that I used for the pockets. 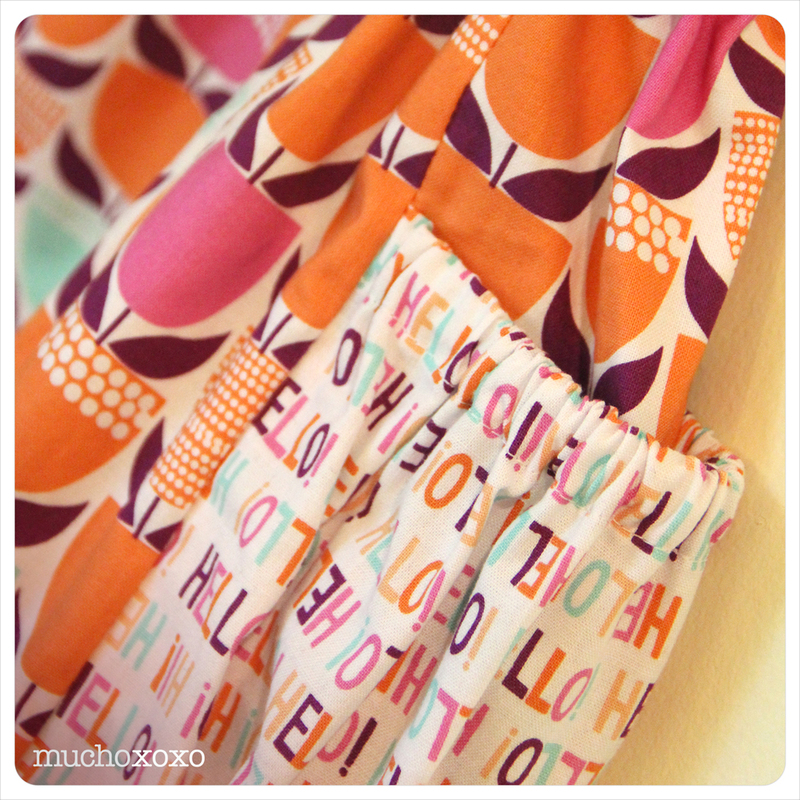 These roomy, gathered pockets are perfect for stashing toys, seashells or little love notes. A few of my test runs before I jumped in for real (good, bad and ugly). I’m really glad I did this. I’ve never made my own pattern, so this was a fun experiment for me. Also incredibly helpful to see how my sketch, and assumptions (some of which were surprisingly wrong), translated to the real thing. 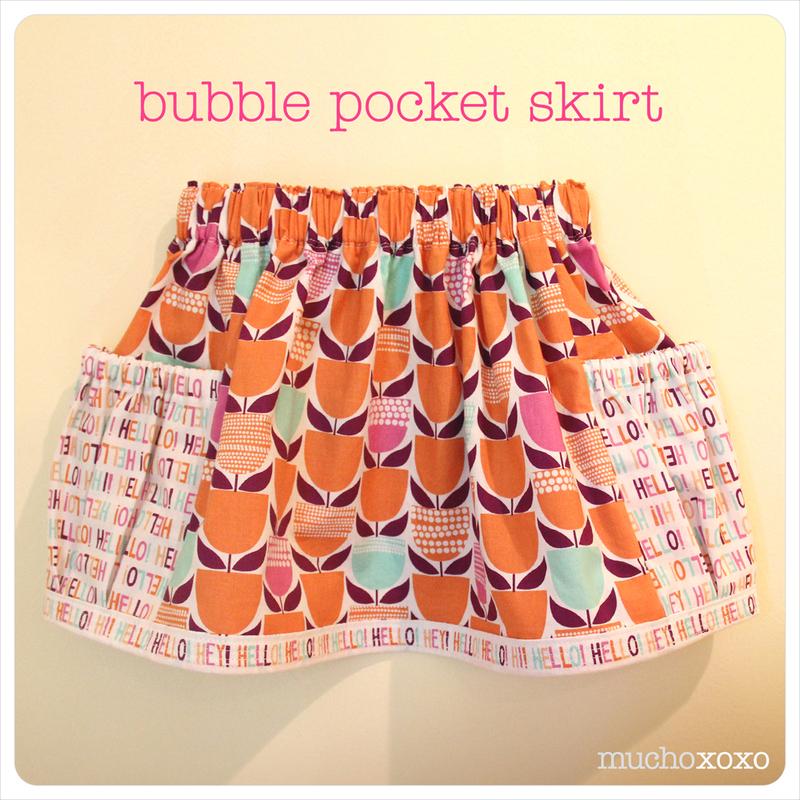 Next stop on the bubble pocket train… A bubble pocket maxi skirt for me!